Thunder Bay Press, 9781684120277, 416pp. An entertaining and educational overview of our nation’s chief executives. The highest office of our country has been a challenging one to occupy, from the times of a newly found nation to the global power seat it has become. 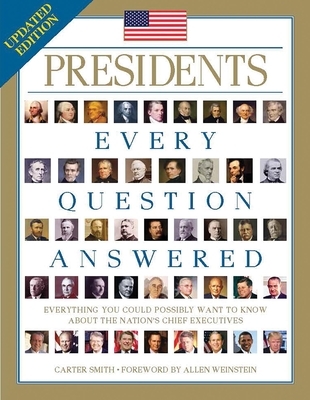 Presidents: Every Question Answered reviews our leaders’ time in office and how their distinct characteristics became evident in the laws and improvements (or regressions) made during their terms. Biographical facts, First Ladies, and the administrative personnel that shared each president’s days are contained in these pages. Whether you’re a history major looking for extra credit, or just curious to know more about the melting pot of the United States, this book will give you insight and answers to your questions. Carter Smith has written and edited numerous works on American and World history, including The African-American Experience On File (Facts On File), the five-volume Daily Life in 20th Century America (Greenwood) and Mapping Epidemics: A Historical Atlas of Disease (Scholastic). He is currently working on an atlas of U.S. History.